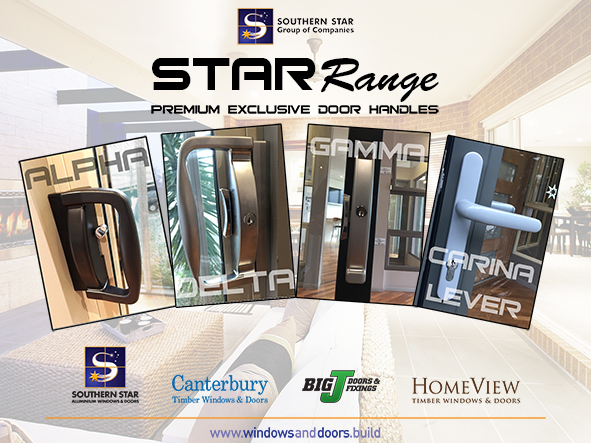 The Southern Star Group has a stellar range of handles available for all of our windows and doors. The STAR Range is our collection of innovative and exclusive bespoke hardware developed and crafted in-house specifically for our products. The Alpha handle has an elegant contoured design for added comfort and grip, perfect for our aluminium or timber sliding doors. The Alpha features a twin-beak lock with C4 key pin cylinder, which allows it to be keyed alike to any lock by a locksmith, offering the extra convenience of having to use only one key around the home. Suited to any application and home design whether traditional, modern or architectural, the Alpha is available in Ultra Silver for Canterbury Timber sliding doors and Black for Southern Star aluminium sliding doors. The Alpha comes standard with 100, 200 and 300 Series Southern Star Aluminium sliding and stacking sliding doors and Canterbury Timber sliding and stacking sliding doors. The Delta handle’s uniqueness is emphasised by its stunning finish; being offered in satin chrome as standard. The Delta offers a secure, twin- beak lock, offered as standard. In addition, the Delta also features a C4 key pin cylinder, which allows it to be keyed alike to any lock by a locksmith, offering the extra convenience of having to use only one key around the home. The Delta is an upgradable option for 100, 200 and 300 Series Southern Star Aluminium sliding and stacking sliding doors, as well as Canterbury Timber sliding and stacking sliding doors. The Gamma has been designed to meet the desire of architects and homeowners who want a streamlined non-obstructive handle that allows unimpeded views through glazed doors. The sleek and smooth design reflects the popularity of these elements within contemporary styling, while the subtlety allows traditionalists to enjoy their classic décor and design without intrusion. Its slim structure attaches stealthily to all Southern Star Aluminium and Canterbury Timber sliding and stacking sliding doors, providing the same elegant and effortless operation accustomed to be expected from Southern Star Group handles. The Carina Lever showcases elegance with smooth styling and practical functionality, utilising ergonomically constructed design for increased comfort and ease of use when operating. The Carina is available in a standard cylinder/snib or optional cylinder/cylinder setup, adding the benefit of providing security and safety to homes entries. An ultra silver external finish compliments any door and interior theme; while providing a beautiful additional element to our line of compatible aluminium doors. The Carina Lever Handle comes standard with the 100 and 200 Series Aluminium Bifold and French doors. Visit our website or a showroom to learn more about the STAR Range of hardware and all our products.